Spinal Surgery, no doubt, has always been a complicated procedure. People suffering from spinal disorders and complications often fear to go under the knife for the surgery, owing to the high-risk factor and longer recovery times. However, with recent advancements in the technology, much of the fears of the patients have been dealt with, and spinal surgery has now become a much much simple and safe procedure. One such major technological advancement has been the introduction of minimally invasive spinal surgery. 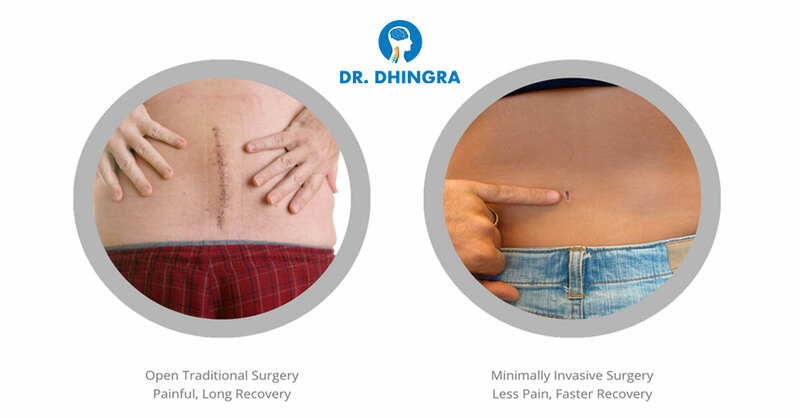 Dr. Dhingra’s, being a coming of age, best endoscopic spine surgeon in Chandigarh, embraces the latest technologies in the medical field and applies them to use. Minimally Invasive Spinal Surgery technology reduces the risk factor of the surgery by many times. As the name suggests, the surgery is carried out by minimal invasion into the body, which reciprocates to lesser bloodshed, less exposure to infections and minimal chances of human error. Therefore, the spinal surgery procedure has become much safer nowadays. Minimal Invasion into the body during the surgical procedure also means that the patient will have to suffer much lesser pain. Traditional surgery calls for an open procedure that means larger cuts on the body, and a number of stitches, which are extremely painful during the days following the surgery. However, this pain is largely eradicated through the minimally invasive technology. While a traditional surgery takes months for the body to completely recover, the recovery period in case of minimally invasive surgery is much lesser. This also means that there will be a shorter stay at the hospital, and the patient can get back on the feet, and to work, in a few days after the surgery. Dr. Anil Dhingra’s is a top spine surgeon in Chandigarh, which provides the latest technology and technical expertise for the minimally invasive spinal surgery.